I loved using cartoons when I was teaching high school--political cartoons, children's books, and especially the way Bugs Bunny, Sargent SNAFU, and others were used during World War II. (I used the video, Cartoons Go To War, but I'm sure there are other sources for these as well.) There is also a great collection of Dr. Seuss' work during World War II. 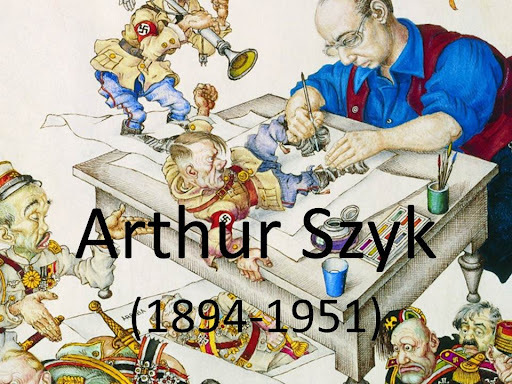 One person I was not familiar with, however, was the artist Arthur Szyk. Szyk considered art to be not his "aim" but his "means." He was an activist artist who used his art to convey a message and was a strong anti-Nazi artist working in the United States during the time of the war. 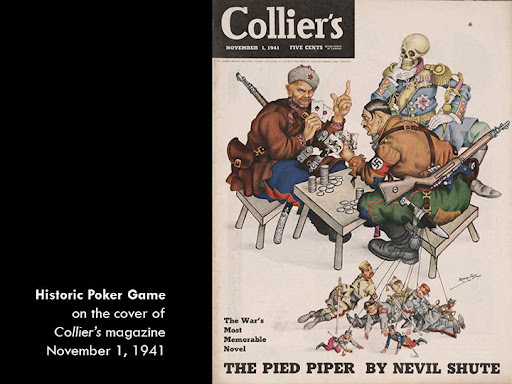 His art was on the cover of Time and Collier's magazines, known and seen regularly by US Soldiers. Last weekend I had the privilege of seeing Szyk's work at the LA Art Show and talking with Irvin Ungar, who serves as curator and historian for the works of Arthur Szyk. As an artist, Szyk does amazing work reminiscent of medieval book illustrators. 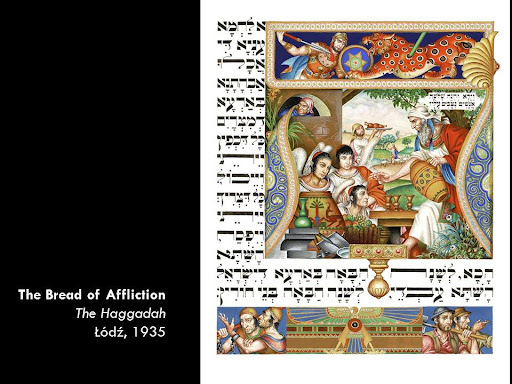 His Haggadah is one of the most famous of these pieces, and it is truly beautiful. In the time leading up to and during World War II, Szyk was quite active. I think of Norman Rockwell's magazine art from the time, so I enjoyed being able to learn about Szyk's work, which highlighted leaders well-known at the time and conveyed his opinions on the current issues. Irvin Ungar and I spent a bit of time with this piece. Russia (represented by "Ivan" as the United States might have been represented by "Uncle Sam") plays Hitler while death looks on. Szyk's hope for an Allied win despite his losing poker hand is shown by his having more chips. Not being a poker player myself, I appreciated the additional information and insight from Ungar, and am thrilled to now know more about both the artist and the resource that Ungar and The Arthur Szyk Society have put together online. On the website (www.szyk.org) , you can explore a number of his collections, including a slideshow of pieces from Szyk's World War II work. There is also a traveling exhibit, Justice Illuminated, which can be viewed online or brought to a host site. Facing History has a great collection of primary sources exploring the Weimar period which includes art from Germany at the time. I'm glad to know of this additional source for exploring art present in the United States - it seems like a wonderful resource for classrooms considering the Holocaust, World War II and American involvement.